Horus was one of the earliest and most important Egyptian gods. He was originally portrayed as a hawk or falcon and worshiped as a sun god and creator of the sky. His right eye represented the sun, and his left eye represented the moon. Later images show him as a man with the head of a bird. The early rulers of southern Egypt were followers of Horus. When they conquered northern Egypt and reunited the two lands (around 2200 B . C .), Horus became the symbol of the newly unified country, and the pharaoh was considered the incarnation of Horus. In time, the worship of Horus—under his various names—spread to many places. Horus, worshiped as a sun god and creator god by the ancient Egyptians, was often shown with the head of a bird. Horus became a major figure in Egyptian mythology. Before he was born, his father Osiris died at the hand of his own brother Set*. When Horus grew up, he swore to avenge his father's death and fought Set many times. In one version of this story, Set blinded Horus in his left eye, but the god Thoth healed it. Horus ended up killing Set, however, and the gods named Horus ruler of Egypt. The restored eye, called the udjat or wedjat, became a powerful magical symbol of protection in ancient Egypt. The Egyptians used the story of Horus's wounded eye to explain the changing phases of the moon. In another account of the conflict between Horus and Set, the two came before a council of the gods to decide who would inherit Osiris 's throne. Most of the council accepted Horus's claim, but the sun god Ra favored Set because he was older and more capable. As a result, Horus and Set undertook a series of contests to determine who would become the ruler. On one occasion, both gods turned themselves into hippopotamuses to see who could stay under water longer. During the contest, Horus's mother Isis* had the chance to kill Set but chose not to do so. Horus was angry at his mother and fled into the desert. Set found him and put out his eyes, but the goddess Hathor repaired them with the milk of a small antelope. In the end, the gods agreed that Horus should be the ruler. 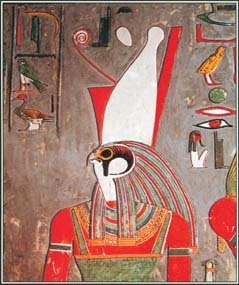 Horus then invited Set to join him and live in the sky as the god of storms. See also Birds in Mythology ; Egyptian Mythology ; Hathor ; Isis ; Osiris ; RΑ(Re) ; Set ; Thoth .